A few years back, I posted a look at Brett Favre’s place in history through unusual means. It’s time for an updated rundown of who makes the cut. Instead of doing the same old “let’s rank these guys and see where they fall” method, I’ll opt for a bit more of a dividing line. We’re going to use the table process of separating quarterbacks. In other words, when you’re at a wedding reception and seated in an awkward spot like right near the kitchen or in front of a speaker, you’re in Randall Cunningham territory. That clearly means you’re talented enough to get the invite and make it into the room but at the end of the day you didn’t quite have the credentials to stay away from the awkward seat right near the kitchen. You just lacked the stroke to get a cooler table flanked by a few single women. So, if I’m having a party inviting the greatest and/or most influential quarterbacks all-time, here is the invite list. Who Sits Here: Accomplished quarterbacks, who are often forgotten because of the era they played, and other assorted folks. Jim Plunkett – Nine quarterbacks have won at least two Super Bowls and he’s one of them. Yet, if you asked the average football fan, they would probably wouldn’t remember Plunkett. Len Dawson – He won the Super Bowl MVP but yet it seems the biggest star out of the Super Bowl IV over the Vikings was Chiefs head coach Hank Stram, thanks to NFL Films. Bert Jones – He could sling it but overshadowed by the other greats of the 70s. Aaron Rodgers – Since Rodgers is still a young pup, he goes here. Plus, until he gets a second Super Bowl ring, he’s not going to approach the Manning/Brady group in stature even though A-Rod has the same number of rings as Peyton. In his fourth year as a starter in 2011, Rodgers set the NFL record for passer rating with 122.5 on the way to winning the 2011 MVP. Incredibly, despite Peyton trying to obliterate every passing record in ’13, Rodgers still holds the mark for highest passer rating in a season. Steve McNair- Much of the same as Jones; someone was always in the way. He won an MVP in ’03 but shared it with Peyton Manning. His team made it to Super Bowl XXXIV but fell a yard short. He was considered by some to be the John Wayne of quarterbacks in the 2000s. Ken Anderson – One of the most accurate passers in league history; foiled by Joe Montana in Super Bowl XVI. Summary – Since Morton was so dreadful in Super Bowls, he had to go. Whenever a new kid on the block comes along (Rodgers), we have to make room. Meanwhile, Plunkett is trying to figure out a way to get closer to the front of the room. Who Sits Here: Fate dealt them a terrible blow at some point during their talented but yet star-crossed careers. Drew Bledsoe – Could have been a Hall of Famer potentially but instead got mutilated by Mo Lewis, which subsequently ushered in the Brady era in New England. Also, Bledsoe kept the quarterbacking seat warm in Dallas until Tony Romo took over. Donovan McNabb – One of the most confusing and head-scratching quarterbacks of all-time. He may very well be the greatest Eagles quarterback ever but he crashed and burned in Washington and Minnesota as his career came to a close. If this was an actual real party, I’m guessing McNabb would have some choice words about Mike Shanahan after a few Hennessy and Cokes. Meanwhile, no one freely admits what happened to McNabb during the final five minutes of Super Bowl XXXIX. Between that, T.O., Rush Limbaugh, getting booed on draft day and being benched, I’m pretty sure he’s going to have an awesome book one day. Boomer Esiason – He lost two memorable games to Joe Montana’s 49ers in the late 80s including the heartbreaking Super Bowl XXIII. Then, he watched as the Bills became the “creators” of the no-huddle offense when the Bengals actually started the concept in ’88. Y.A. Tittle – Poor fellow. He’s a Hall of Famer but remembered for losing three straight NFL title games from 1961 to 1963. Joe Theismann – Won Super Bowl XVII but has the stigma of LT and Jack Squirek hanging over his head. Summary: I’ve got to imagine this would be one angry table except for Tittle, who would probably just be happy to be there. Who Sits Here: People keep flocking to this table because it has quarterbacks with singular career achievements/moments, but man, they can tell some great stories. Drew Brees – Before waxing poetically about Super Bowl XLIV, a quick statistical note on Brees. Over the course of the NFL’s previous 94 seasons, a quarterback reached the 5,000 yard passing marker on eight occasions. Brees accounted for four of them, which is crazy considering it happened once prior to 2008. However, the crown jewel of his career achievement is winning Super Bowl XLIV and defeating one of his chief contemporaries (Peyton Manning) in the process. Brees helped resuscitate football in New Orleans after the city was ravaged by Hurricane Katrina. Eli Manning – Question. Does he bring David Tyree or Mario Manningham as his plus one? Nonetheless, he can always say he was 2-0 against Brady/Belichick in the Super Bowl. Anyhow, I’m not on the “Eli is a Hall of Famer” bandwagon. His team either wins the Super Bowl or misses the playoffs normally. However, when the day comes for the Canton discussion, his last name might carry some extra weight. Joe Namath – I’m not sure one man prospered off of one game more than Namath. Seriously, examine the rest of his career. He was very average and banged up a great deal. Yet, that one guarantee back in January 1969 makes him a legend. Plus, he loves the ladies. ***EDITOR’S NOTE – This Farrah Fawcett commercial is an example of how t0 parlay one singular moment into a lifetime of being The Man. Quick…name one notable thing Joe Namath did in his NFL career after Super Bowl III. That’s right, you don’t have to because it doesn’t matter. Bob Griese – A forgotten baller in NFL history. The only man at the party who could say he led his team to an undefeated season. One season later, his Dolphins repeated as Super Bowl champ. So, over the span of three seasons, he played in three straight Super Bowls, winning two of them, and helped his team go 17-0. My only thing with Griese? Played in a run-heavy era for a run-heavy team. He only completed 26 passes in three Super Bowl appearances. Earl Morrall – Ah yes, the only man who can raise his hand to the aforementioned question. When Griese got injured during the ’72 season, Morrall picked up the pieces and held the fort. While he did manage to lose Super Bowl III as Baltimore’s starter (not Johnny Unitas), he has three rings. Ben Roethlisberger – Well, well, well. Roethlisberger missed out on ring number three thanks to Mr. Rodgers and the Packers but still is a Super Bowl XL and XLIII winner. Although, can we say that he actually has 1.5 rings? That Super Bowl XL effort was awful. Yes, he was a second year quarterback but so was Russell Wilson. At least he made up for by saving Pittsburgh’s bacon with a supreme game-winning drive in Super Bowl XLIII and delivering one of the greatest throws in league history. Joe Flacco – “Hey guys, did you know I had one of the greatest postseasons for a quarterback in NFL history? Also, you know who Ray Lewis can thank for going out as a winner? Me.” At this point, Griese corrects him and quickly whispers the name “Rahim Moore” in his ear. Alas, Flacco’s absurd ’12 postseason (11 touchdown passes, zero interceptions) and Super Bowl win makes for easy admission on this list. Summary: Joe Namath is the king of this table. He’ll buy drinks for everyone while Griese and Morrall will wonder why they aren’t getting all of the attention since they played on the ’72 Dolphins. Who Sits Here: Quarterbacks that did something to change how the position was played or who won with under less than great circumstances. Arguably one of the coolest tables in the room. Benny Friedman – While playing with the Detroit Wolverines in 1928, he led the league in passing and rushing touchdowns. You’ll never see that again. Bobby Layne – The man won three championships with the Detroit Lions. Considering the mess that developed in Layne’s departure, his three titles with the Lions are a herculian achievement. Sid Luckman – He and Sammy are likely to have a few discussions about Sid’s t-formation and Chicago’s 73-0 win in the NFL title game over Washington. Sammy Baugh – A QB and a punter, this man was one of the first truly great quarterbacks. Warren Moon – The King of the CFL’s Grey Cup before landing in the NFL as a member of the Houston Oilers. Also, the master of the run and shoot in Houston with enough stories about playoff collapses to fill an eight-hour block of television programming. Randall Cunningham – Despite Michael Vick claiming that he revolutionized the position, this is the guy. Cunningham helped usher in the running quarterback era but he could also throw it down the field and is one of the greatest athletes to play the position. However, he’s hounded by his futility in the playoffs. Gary Anderson’s missed kick in the 1998 NFC title game represented Cunningham’s best chance at reaching a Super Bowl. Summary: One of the coolest tables in the room. Who Sits Here: The one table that has a hodge podge of quarterbacks from different eras who very little in common. Sonny Jurgensen – He probably has enough non-football stories to last all night long. Phil Simms – To this day, he owns the single best completion percentage for a game in Super Bowl history (22-25, 88%). He’d remind the table of this quite often. At least his Bill Parcells anecdotes would be highly entertaining. Perhaps, he would be higher up on the scale if he didn’t break his leg during the ’90 season and therefore miss New York’s Super Bowl XXV run. John Hadl – A quarterback wearing a number in the 20s? Only Doug Flutie would approve of such a choice. Kenny Stabler – Played the role of Tom to Terry Bradshaw’s Jerry. Typically, something normally bad happened to the 70s Raiders until John Madden’s gang finally got over the hump during the 1976 season. John Brodie – Not only a former NFL MVP but probably the best golfer in the room since he had another athletic career as a golfer. Russell Wilson – The newest addition to the table might be the single most positive athlete in NFL history. Ever seen Wilson mad? Perturbed? White hot angry? No. He is happy to be a Seahawk and happy to be a world champion. He’d probably just sit around and listen while flashing his new Super Bowl bling. Norm Van Brocklin – The two-time NFL champion also served as a head coach for the Vikings and Falcons, when there were still relatively new to the league. Summary: No chemistry or common bonds at this table; just a lot of awkwardness. Who Sits Here: The only way you sit at this table is if you’ve played in at least three Super Bowls. Troy Aikman – He is one of two quarterbacks to win three Super Bowls in four years. Two things prevent Aikman from being a higher climber here. First, he never did anything of Dallas’ big run from 1991-95. The Cowboys won one playoff game before Aikman retired in 2000. Also, two of the biggest keys to the 90s Cowboys – Emmitt Smith and the Great Wall of Dallas. The combo of Smith running effectively (and in the long run becoming the league’s all-time leading rusher) and the massive offensive line primarily paced the Cowboys to those three Super Bowl titles. Roger Staubach – Staubach grabbed two Super Bowls during the 70s but fell twice to Terry Bradshaw’s Steelers in Super Bowls X and XIII. Survived Tom Landry’s crazy two quarterback system that saw him split time with Craig Morton. In retrospect, that was pretty crazy. Anyhow, Staubach helped form the Cowboys into America’s Team with his effective blend of running and passing. Fran Tarkenton – As mentioned with a few quarterbacks earlier, this guy is the poster child for the phrase “wrong guy in the wrong place at the wrong time.” His three Super Bowl losses came to a Dolphins team that went undefeated a season earlier, the first Steeler team to a win Super Bowl and the ’76 Raiders, who until that point were always next year’s champions. So sorry Fran. Jim Kelly – Despite never winning a Vince Lombardi Trophy, getting his team to four straight Super Bowls is one of the greatest accomplishments in the history of American team sports. Unfortunately, the Ricky Bobby “if you ain’t first, you’re last” mentality casts a significant shadow over Buffalo’s accomplishments. However, Kelly beat nearly every big name quarterback during that run including Joe Montana, Dan Marino, Randall Cunningham, Warren Moon, and John Elway to name a few. Kurt Warner – The goody two shoes of the table. He led one of the great offenses in NFL history with the 1999 St. Louis Rams. Also, he came within a few plays of having three rings while dropping Super Bowls XXXVI and XLIII to the Patriots and Cardinals respectively. Warner remains the only quarterback in the modern era that can say he stocked shelves at a supermarket and years later became a Super Bowl MVP and two-time NFL MVP. Summary: Kelly and Warner would be the life of the table but for different reasons. Who Sits Here: They feel that they have every right to sit somewhere else…namely at Table #1. However, mitigating career circumstances prevented them from landing at the ultimate table. Terry Bradshaw – While he has four Super Bowls, we can’t put everyone at Table #1. Plus, he had the Steel Curtain defense and may have lost his job to Joe Gilliam if not for the quarterback’s on and off-the-field issues. Also, he did Cannonball Run. That’s a major red flag. However, few quarterbacks in league history threw the deep ball as well as Bradshaw. When the spotlight was on, few delivered quite like the Blonde Bomber. Steve Young – The NFL’s cerebral assassin at quarterback. People forget he actually has three rings but only the Super Bowl XXIX win as a starter. I don’t think he’ll be downing any kamikazes with Joe Montana at this event. Young was a precision passer that was hounded by his inability to get past the Cowboys in the 90s. Eventually, he did and threw six touchdown passes in his career defining moment at Super Bowl XXIX. Dan Marino – Well, at least he’s not the only one at the table who missed out on winning a Super Bowl. By the way, his records are evaporating with each passing season. Maybe it’s me but with each passing year, Marino’s accomplishments drift further and further into the rearview mirror. Unfortunately, rule changes regarding bump and run to open up passing attacks will do and Brett Favre refusing to retire does that type of thing. Sorry Danny. Peyton Manning – After getting boatraced out of Met Life Stadium last February, Manning’s legacy is pretty solidified at this point unless he has a crazy finish to his career. He is likely to retire the all-time leader in passing yards and touchdown passes. However, that will be of little significance if he only leaves the sport with one Super Bowl ring. Quarterback A is Peyton Manning. Quarterback B is Kurt Warner. The latter lost two Super Bowls by a combined seven points. The former lost his two Super Bowls by a total of 52 points. Warner should sleep easier at night than Manning in regards to their Super Bowl performances. So, if you’re argument is Manning is the greatest, his performance on the game’s greatest stage has some notable holes to it. Ultimately, Manning is 11-12 in the playoffs and the owner of a Super Bowl win. Yet, he also owns a 1-2 Super Bowl record. Kids, you can’t sit at the big boy table with the most postseason losses ever for a quarterback, one Super Bowl ring, and a sub .500 record in the Super Bowl. Plus, he’s not even the best quarterback of his era…that dude will be introduced shortly. Brett Favre – Speaking of one Super Bowl ring, we arrive to Mr. Favre. The current titleholder of the league’s all-time records for most passing yards and touchdown passes, Favre played 20 seasons with the Falcons, Packers, Jets, and Vikings before finally calling it a day. Few quarterbacks possessed the natural skills that Favre did, who a had cannon for a right arm. However, Favre’s historical blackmark will be his decision-making which got him into plenty of hot water during the playoffs. Dan Fouts – He’s the quiet one at this table since he doesn’t own a ring or a Super Bowl appearance but as fellow teammate Hank Bauer once said about Fouts, he’s “the head motherf***er in charge.” I want that guy at my table. Summary: Three southerners and a graduate of BYU. Let the good times roll! Although, Peyton will have an issue with his table placement. He’ll want an upgrade. Who Sits Here: Enough championship pedigree to drown the room in rings and you’ll need to get permission to talk to them. They drink Manhattans, Martinis, and Jack straight up, while you’re still trying to down your first Coors Light. Bart Starr – He lost one championship game in 1960 and then proceeded to win five NFL crowns. I suppose his head coach was decent. Otto Graham – Can you imagine if a quarterback played in 10 Super Bowls in 10 seasons? Twitter and ESPN’s First Take would explode. Yet in the pre-Super Bowl era, this happened. Graham won seven league titles between the AAFC (All-America Football Conference) and NFL. Automatic Otto played in 10 championship games in 10 seasons. I’d say that’s good enough for this table. John Elway – Terrell Davis and Denver’s tremendous offensive line made it possible for Elway to sit here. Without TD, Elway was 0-3 in Super Bowls. With him, you know the rest. Elway’s first three Super Bowl appearances were with an inferior cast. When you’re rolling into Super Bowls with your calling card being the Three Amigos (Vance Johnson, Ricky Nattiel, and Mark Jackson), that’s bad news. Luckily for him, Elway rallied with two rings and back to back titles to close out a tremendous career. Simply, one of the most physically gifted players to play the position. Tom Brady – Two MVPs. Five Super Bowl appearances. Three Super Bowl rings. The only quarterback to lead a team to an undefeated regular season…BUT he lost to the Giants twice in a pair of Super Bowls. Once was a fluke and the other New England didn’t make enough plays. On the bright side, Brady is doing things quarterbacks just don’t do these days. He finished with over 5,000 yards passing in 2011 en route to landing the Patriots in another Super Bowl. Even though his fourth Super Bowl ring is becoming rather elusive, having three is not a bad option either. If Brady retired tomorrow, there’s a relatively solid case for him being the greatest quarterback ever. Johnny Unitas – The late Johnny U played in the “Greatest Game Ever” and grabbed three NFL titles and a Super Bowl ring in his waning days as a member of the Colts. He also played as a backup in Baltimore’s infamous Super Bowl III loss to Namath’s Jets. Too cool for school and maybe this table. 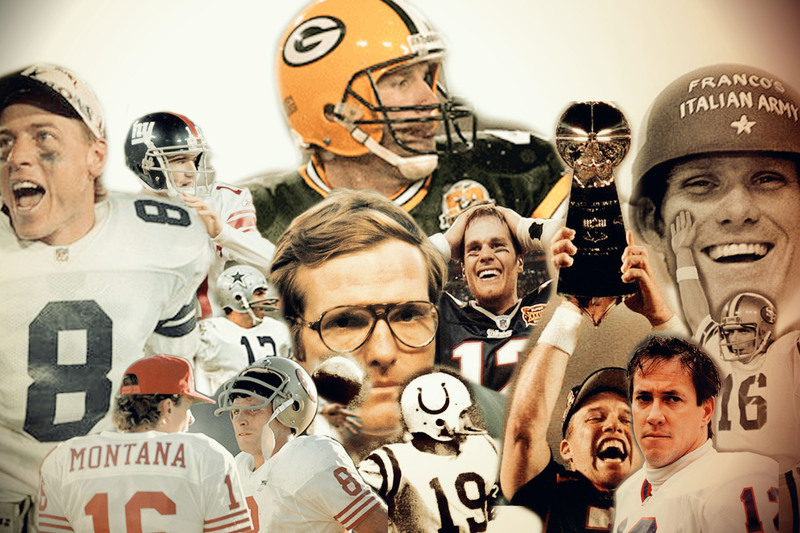 Joe Montana – Personally, I’d give a slight edge to Joe over Brady for the mythical “greatest ever” title. Four Super Bowl rings and he literally dragged an undermanned Kansas City Chiefs offense to the brink of a Super Bowl helps add to his case significantly. Although, Bill Walsh tried to replace Montana with Steve Young on rinse and repeat during the ’88 season, which is bizarre. Nonetheless, Montana is the king of this event, likely to be sipping on Merlot or some other fancy pants red wine. Summary: Peyton would keep trying to drag his seat to the table only to be escorted away each time. Only the super heavyweights sit here with Joe being the heaviest of them all.